Your pet listing will be listed in our missing pet register and our found pet register and also be added to our Twitter, Facebook and Google+ accounts for maximum exposure. You can print off and distribute your own automatically generated missing pet posters. 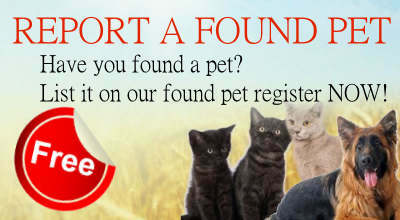 Click here to register and list your Lost Pets and Found Pets for FREE! 1,000s of Lost Pets and Found Pets listed in our pet databases. 1,000s Members making use of our products & services. Join Now! 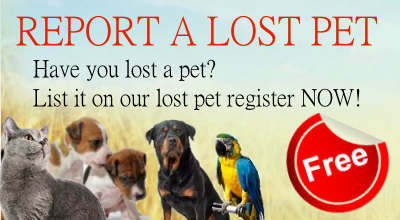 Any pets matching that have been listed as lost will be displayed enabling you to contact the owner directly. Our system uses a Close Pet Match and General Pet Match algorithm to ensure that as many relevant pet matches are made. Print your own Free Pet Posters! 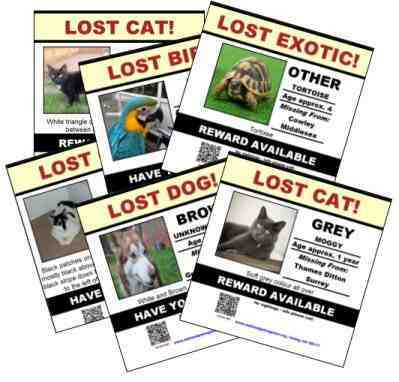 Report a Lost or Found pet to our system and you have access to print your own Lost Pet Posters instantly complete with QR Code for mobiles. We will help you find your missing cat and help find your missing dog or any other domestic animal or pet you have. These features and more are available now for you to help you find your missing pet or the owner of a pet you have found. We also operate a comprehensive Pet Registration service and can supply each of your pets with a unique NMPR PetID which can be activated immediately if your pet goes missing. No matter what type of pet you have found or lost, we will do all we can to help you be re-united with your lost pet or help you find the rightful owner of a pet you have found. It only takes a minute to create an account, so register now.